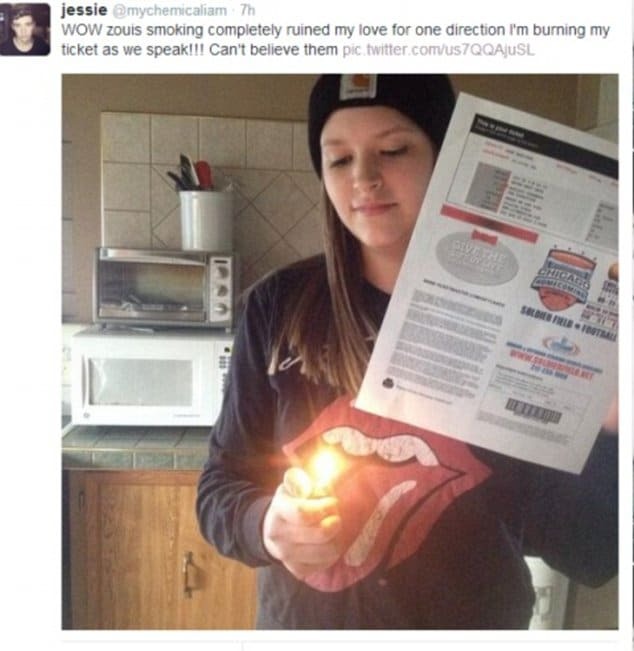 One Direction fans burn tickets over joint video. Are they doomed? Home Scandal and Gossip One Direction fans burn tickets over joint video. Are they doomed? It seems fans insist that their One Direction band member heroes remain peachy pie and clean to the brim, this after One Directions fans took to burning tickets after a video of band mates smoking joints turned up. 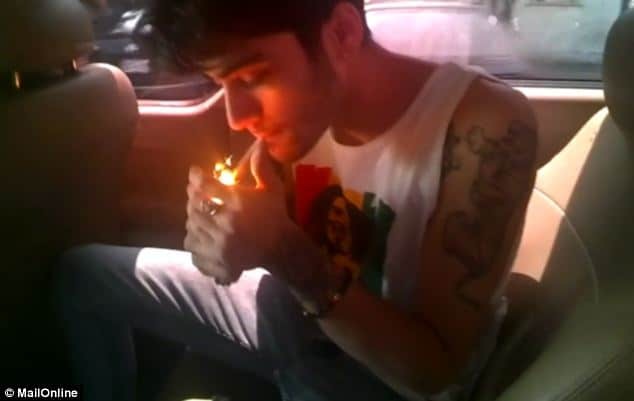 It all came to a head after the UK’s dailymail released an exclusive video of band mates Zayn Malik, 21 and Louis Tomlinson, 22 smoking and joking about marijuana. Also joining the fray are drug charities and parent groups who have criticized the band for failing to take ‘real responsibility as role models’ to millions of children. Told one fan, Julie Talbott, 16 from the UK: ‘It is disgusting. It is completely wrong, they get paid so much money and they spend it on drugs. It is a bad message for children, I have heard kids talking in the queue saying it is all right. They think if the boys do it then they can do it. I could kill them as they have taken over my daughter’s life for three years and she would never do it but it is worrying’. Mentor, the alcohol and drug protection charity said: ‘Zayn and Louis have a great opportunity to be a good role model for young people but they blow it here. ‘We hope their young fans are not swayed by their example’. Nick Barton, Chief Executive Action on Addiction added: ‘Young people often experiment with drugs and alcohol. It can be the case that some young people are influenced by their immediate peers and others might alter their behaviour on account of high profile young celebrities’. Which is to say being a teen hero these days may mean having to revise public behavior, never mind the fact being a celebrity or a famous rock star in the past used to mean having one controversial foible after the after, which of course would only cement one’s legendary bad boy appeal amongst fans. Then again perhaps One Direction band mates ought to have an honest assessment and realize the only reason they are so popular is not because they play up to yesteryear heroes and antics but exactly the opposite of it. Which is to say are prodding with fire in the face of such knowledge? Nevertheless not everyone is particularly roughed up by the antics of band members, with some taking to social media to profess their love of the group irrespectively. 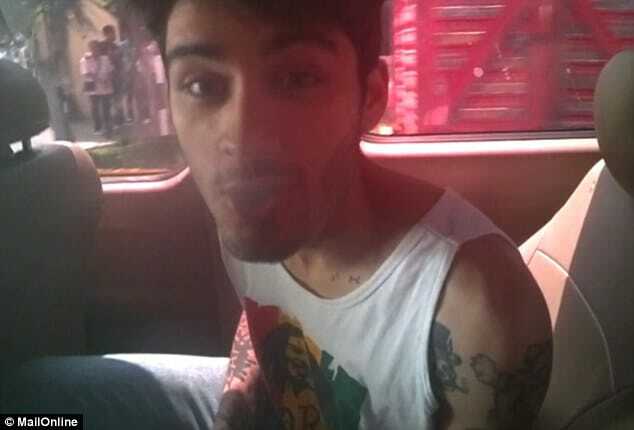 Is Zayn really the rebel he thinks he is? Told Nicola Lamond: ‘Popstars doing drugs is nothing new – but when you market your music to pre-teen children, you take on real responsibility as a role model. ‘Parents need to know their infant and junior age child’s idol won’t be caught out doing anything illegal or immoral. Interestingly Simon Cowell who engineered the putting the together of the band back in 2011 and guiding them to ultra success has yet to publicly comment but one can imagine him not being too thrilled as he seeks to continue on expanding on One Direction’s success and good boy antics. Good boy antics until now that is ….